[NEWS Kyungnam] The ‘art exhibition’ of President Jung Myeong Seok, Christian Gospel Mission, has begun. ▲ Painting, top left: Destiny was selected as Jung’s feature work at the International Art Fair in 2011, and it received praise from people around the world. Through this painting, President Jung Myeong Seok expressed the destiny of the weak before the strong. If you look at the lines in this painting, they [seem to] depict the musical notes of Beethoven’s Symphony, “The Fate of Destiny”. The top portion of the painting was drawn with bold lines and the bottom portion was drawn softly to express the sorrow [of life]. Painting, right: A painting of a palm tree. Because of his desire to harmonize distinct subjects, he uses calligraphy as an element of his painting. Painting, bottom left: He painted these pine trees using minimal artistic techniques and without including unnecessary details. The artist added a poem, which integrates his thoughts into the painting. How would a world of art—where life becomes art and art becomes life, created through communion with the Divine Being—come to be? As a religious leader, he incorporates art with religion and his style is unique and free, without the restrictions of formality and genre. The exhibition of his unique world of art has begun. This artist is President Jung Myeong Seok of Christian Gospel Mission. The exhibition of his artwork at Gusang Art Museum in Wolmyeongdong Geumsan-gun in Chungnam Province began on February 21. Besides the palm trees, cliffs and pine trees usually drawn by Jung Myeong Seok, you can see a number of other paintings as well. President Jung Myeong Seok expressed his view on art: “You must know the Holy Son Jesus, Who is the way, the truth and the life. Then you will be able to create art and make your life into a perfect work of art.” In his artwork, his philosophy is embodied and freedom unleashed in the learning of the truth which is alive and breathing in his paintings. A snail, like the one in Destiny, is the stork’s favorite prey. No one would say that the snail had any chance of survival, not even the stork: “You are my prey. You will be dead in one peck..” However, the snail does not surrender to death but says, “I will live.” It is running with all of its might to avoid death. No matter how fast the snail may run, before the stork, that speed is like the speed of the hour hand before the second hand. The artist said that he drew a person who left his destiny up to God. It is a painting filled and overflowing with the Will of God, and contains the Will to convey to people that you cannot do whatever you want with your life, but destiny belongs to Heaven. He encapsulated the messages, ‘If you give up, you will die,’ ‘You will be defeated,’ and ‘Do not be self-conscious, but do it until the end.’ When you look at the lines of the painting, it may seem as though Beethoven’s Symphony, “The Fate of Destiny,” is appearing to you. The top portion was drawn boldly and the bottom part was drawn softly, to express the sorrow [of life]. The elements that appear in his drawings are mountains and sea, sun and birds, trees and rocks, and many other features commonly seen in nature. However, it is never ordinary when the image of these elements is captured on canvas. The reason is that President Jung is not confined within institutionalized education or sensory experience, which is limited to the physical body and external substances, but he freely connects with [images in his mind] through his communion with the Divine Being. In addition, his art is understood to be the fruit of ceaselessly challenging himself to capture an original image that is beyond the sense of vision. In other words, it is to represent the high-level mentality needed to meet with the Divine Being. President Jung Myeong Seok is an artist who does more than just reproduce a model, but freely he creates his own world of new art. Yet there is no chaos to be found in that freedom. This is because instead of portraying an imperfect human being or a distorted world caused by the ignorance and error of human beings, he tries to draw the images of freedom within truth and the ideal world over which the Creator reigns. You can see President Jung’s great masterpiece, which actualizes the beauty of perfection called ‘harmony’ and eliminates the distance between human beings and the Divine Being. For this reason that it is difficult to find the style of realism in the objects in his artwork. He puts dynamic vitality into each object, and the object itself is implied. At the same time, he secures an independent domain for the object so that it is not confined into one referent. For example, in a painting of a face, a feature of the fair Divine Being is depicted within the image of a person created from simple lines, or the images of a benevolent Jesus and an ambitious eagle are overlapped. In this, we observe the “aura” of the work, the concept introduced by Walter Benjamin. In addition, pictures of palm trees—which boast a grand appearance and tasteful fruits after having survived seawater and sea breeze—as well as paintings of the weak—such as a weak snail standing against the strong, with the stork playing the role of the big entity—contain significant meaning within them. They encapsulate the ups and downs of the artist’s life, his struggle for the beauty of perfection, shouts of victory and guidelines for life. A canvas showing a series of lightly-colored pictures in Indian ink – cliffs embracing the sea, an evergreen tree rooted to a cliff, a seagull flying in the sky, a crimson sunrise and people in a jet boat – is President Jung’s great masterpiece that actualizes the beauty of perfection called ‘harmony’, harmony which eliminates the distance between the human being and the Diving Being, Heaven and Earth, and mountain and sea. Integral to such works of art is the chronological flow of history and sense of unlimited time that can change a human being’s life. Furthermore, the curve of a line drawn with one brushstroke expresses the sense rhythm in nature, so it adds musical rhythm and increased liveliness to the drawing. In addition, because of his desire to create harmony between things that are distinct, President Jung uses calligraphy in his painting. Including the artist’s signature or adding pictures to his poems are examples of an expression of the desire. His experimental spirit, which boldly tears down the walls of genre and strives for aesthetic unity, has created artworks that are superior to others. Similarly, his artwork, through which he expresses mysteriously and beautifully by seeing beauty through his spiritual eyes and making God’s majestic world of creation the object, has the power to move the soul. The artwork causes us to turn toward the Divine Being and points us toward gaining eternal life by opening the path where one searches for one’s own self. Because of this, those who see the art sympathize with its teachings. As a religious leader, President Jung has combined art with religion Drawing a picture that takes responsibility for a life is a great task. Living one’s life in order to become a work of art is a very valuable and beautiful task. His world of art resonates with the Bible verse, “The truth will set you free (John 8:32).” His art represents communion with the Divine Being and the high-level mind that meets with the Divine Being. At this exhibition, we expect that people will see that the best art is that which has been born through the true unity of religion and art. This exhibition is interesting due to the fact that you can see the artist’s oeuvres and the process of its change. In the case of the painting of the pine tree, the artist said that he completed it by devoting himself intensely to painting and overcoming difficulties, even if the environment and the conditions were such that they did not allow him to paint. By looking at the painting of the cliff also, we can see that he tried to adopt a new method by studying continuously. If you make a group reservation the day before you go, you can view the exhibition while receiving a detailed explanation of the paintings and be guided by a member of the museum’s staff. Admission is free and the exhibition hours are between 10am and 5pm. It is closed on Wednesday. 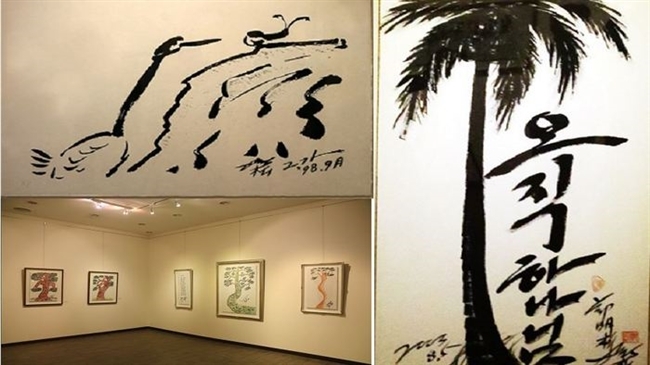 President Jung Myeong Seok has been active in his artistic activities by exhibiting his calligraphy and a number of his paintings in this nation as well as in England, France, Germany and Argentina. In 1995 he began his literary career with the publication of the monthly magazine, The Trend of Literature and he became a published poet. His books of poetry, Woman of Poetry and Speaking Through Poetry, which were published last July, have also become best-sellers. Ten of his poems have been registered in the Unabridged Korean Poetry Dictionary (2011), which covers 100 years of the history of Korean poetry. His biggest works of literature are The Word of Salvation, his sermon collections, The Word of Life and his proverb book, Heaven’s Word, My Word. He has studied the Bible for 50 years and continues to do so while serving as the President of Christian Gospel Mission and President of the International Cultural Art and Peace Association.